A footbridge built of a 20mm-thick stainless steel shell was lifted into place in Ditzingen in Germany last weekend. The bridge, which was designed by Schlaich Bergermann & Partner, will provide access over a road between two parts of the production site of Trumpf, which makes industrial lasers. The 28m-long bridge consists of a lightweight shell construction, which due to the high efficiency of the structure, is made from double curved stainless steel sheets which are just 20mm thick. The shell edge is stabilised by an upstand, eliminating the need for any additional stiffening bulkheads. 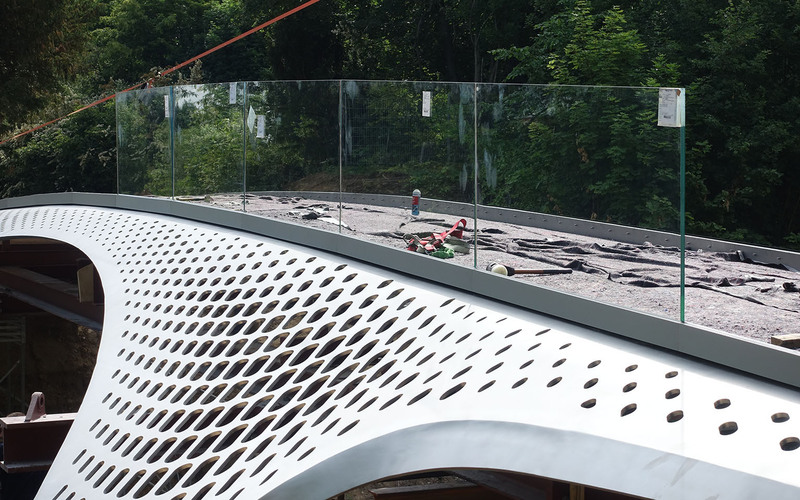 Bridge users will walk directly on the shell, which is coated to prevent slipping. The shell has holes that vary in size according to the flow of forces, and these were cut by using Trumpf laser machines. The size and density of the aperture is based on the degree of use of the structure. In the area of the tread, the lasered apertures are replaced by approximately 14,300 smaller holes that are filled with glass. The lightness of the bridge is highlighted by the very transparent and anti-glare glass railings.